Team Z7 rider, Shane Breen and his horse, Laith combined claim victory in the Dh127,000 two-star Longines Grand Prix at the President of the UAE Showjumping Cup presented by Longines on Friday evening. Breen and Laith cut a swathe through the UAE’s Grand Prix classes in 2018, claiming the four-star Longines Al Shira’aa Grand Prix and the five-star Dubai Showjumping Championship. But injury then sidelined the 12-year-old stallion with Breen only bringing him back to competition at the start of the year. Laith, a multiple five-star winning horse may only just be on the comeback trail yet the formidable pair wasted no time in returning to their winning ways. Completing an imperious first-round clear, five seconds faster than the time allowed, Breen and Laith proceeded to fly round the jump-off course, toppling the in-form Tina Lund from the head of the leaderboard with their time of 39.31sec. Denmark’s Lund and Indiana van Klapscheut finished in second place with a time of 41.28sec, while France’s Frederic David and Ecuador Van Roosakker were third with 43.88sec. Breen, one of seven riders to go through to the jump-off, watched Lund’s round just before he went into the arena. Lund may have missed out on victory in the big class of the day, but she has rarely been out of the money this season and her strong run of form continued into day three when she steered Celvita Z to victory in the Abu Dhabi Sports Council Classic. Her final round time of 52.01sec was good enough to drop previous leader, Frederic David and Levita vd Bisschop of France, down into second with his time of 55.40sec. Saudi Arabia’s Sulaiman Alanbar filled third position on Quintella in a time of 57.96sec. The UAE’s Youth Olympic Games silver medalist, Omar Al Marzooqi claimed the Al Shira’aa Junior Stakes on Coral Beach Z, winning in a time of 55.41 sec. Second was Ali Hamad Al Kirbi on Catch The Wind II, who stopped the clock at 56.18 sec while Abdulla Ahmed Al Ameen Alshurafa was third on Dagonetta in 56.82sec. Thirteen-year-old Saif Abdulla Mohammed Al Shamsi was the winner of the first class of the day, the UAE Equestrian Federation Children’s Stakes on Dezapamillion Mas with a clear round in a time of 55.50sec. Only five riders competed in the 115cm class which saw the runner-up spot go to Abdullah Hamid Ali Al Kirbi and Lover des Patis in a time of 56.49sec. Layth Ghrayeb and Quapitola SR Z were third with their time of 58.12sec. Al Shamsi, who has only been riding for a year was delighted with his round: “My horse is very good but she’s quite fast and she stops sometimes so I have to be careful,” he said. Al Shamsi will return to the arena on Saturday in the two phase UAE Equestrian Federation Children’s Cup. 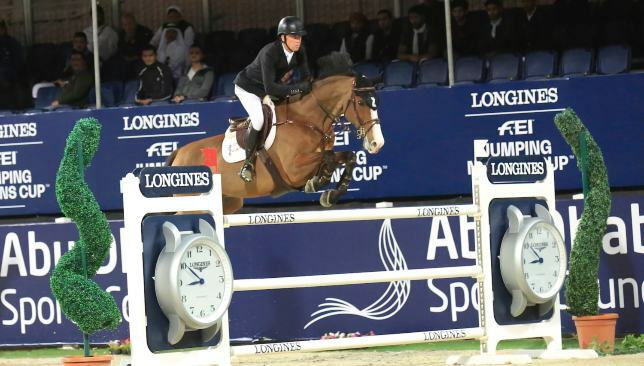 The UAE leg of the Longines FEI Jumping Nations Cup will be held at Al Forsan International Sports Resort on Saturday as the concluding class of the four-day President of the UAE Showjumping Cup presented by Longines. Organised by the UAE Equestrian and Racing Federation, in conjunction with world governing body, the FEI, the top two Middle Eastern teams will qualify for the Longines FEI Jumping Nations Cup Final in Barcelona in October. Aditi Ashok is the defending Fatima Bint Mubarak Ladies Open champion. 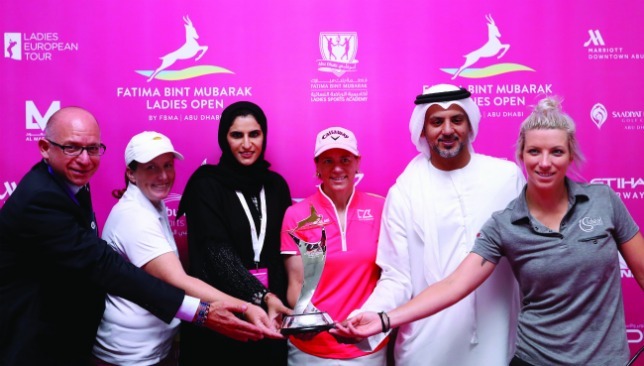 Abu Dhabi Sports Council is announcing the strongest field to date for the 2019 Fatima Bint Mubarak Ladies Open, the first ever women’s professional golf tournament to be staged in the emirate. Held under the patronage of Her Highness Sheikha Fatima Bint Mubarak, the Ladies European Tour (LET) event returns to Abu Dhabi for a third time to the award-winning Saadiyat Beach Golf Club from January 10-13. Kicking off both the 2019 LET calendar as well as Abu Dhabi’s 2019 golf season, the FBM Ladies Open also begins a fortnight of thrilling golf action in the UAE capital, preceding both the fourth hosting of the Gary Player Invitational, set for January 13, as well as the Abu Dhabi HSBC Championship presented by EGA, from January 16-19. Under a new format, the FBM Ladies Open will also be the first tour-sanctioned, entirely pro-am tournament to be held in the UAE. 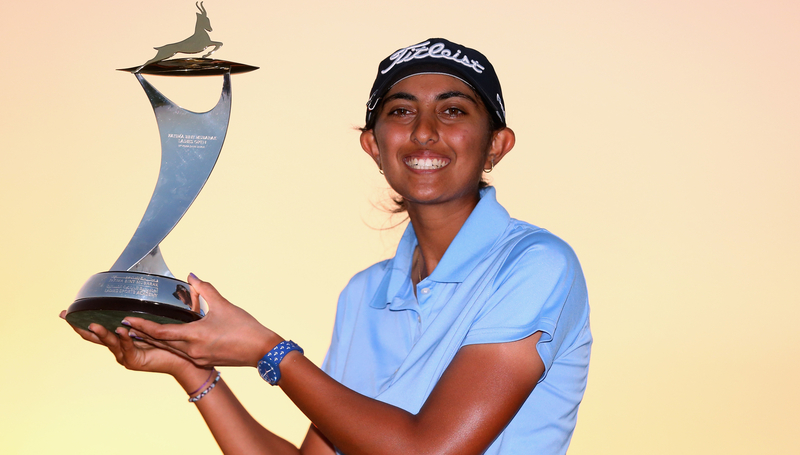 Defending champion Aditi Ashok will be joined by Beth Allen, who won the inaugural FBM Ladies Open in 2016, British star Charley Hull, as well as Becky Brewerton, Catriona Matthew, Becky Morgan, Anne Van Dam, Caroline Hedwall, Astrid Vayson De Pradenne, Jenny Haglund, Meghan Maclaren, Camille Chevalier and Florentyna Parker. Beth Allen won in Abu Dhabi in 2016. Solheim Cup team members Jodi Ewart Shadoff and Emily Kristine Pedersen are also on the list to tee off in Abu Dhabi. His Excellency Aref Hamad Al Awani, general secretary of the Abu Dhabi Sports Council, said: “The Fatima Bint Mubarak Ladies Open continues Abu Dhabi’s rich tradition of not only hosting world-class sporting events but also of providing a global stage to talented female athletes. Under the new format, 56 professional golfers will join forces with 56 amateurs to form team pairings. While all teams will compete on day one and day two of the tournament, day three will see only the top 15 teams advance for their chance to secure a podium finish. The top LET pros will still battle it out for the individual title, which was won by American golfer Allen in 2016 and India’s star Ashok in 2017. Along with on course action, the event will also salute the skill and spirit of the UAE Special Olympics golf team with a golf clinic, led by a selection of top LET professionals to enable ‘determined ones’ to sharpen their skills and discuss tactics and strategy with the world’s leading golfers. The female pros are also scheduled to come together to coach young UAE-based female golfers as part of its #ThisGirlGolfsUAE activation, that seeks to encourage the sport among girls in the emirate and beyond. The tournament is hoping to inspire Emirati ladies to take up golf. 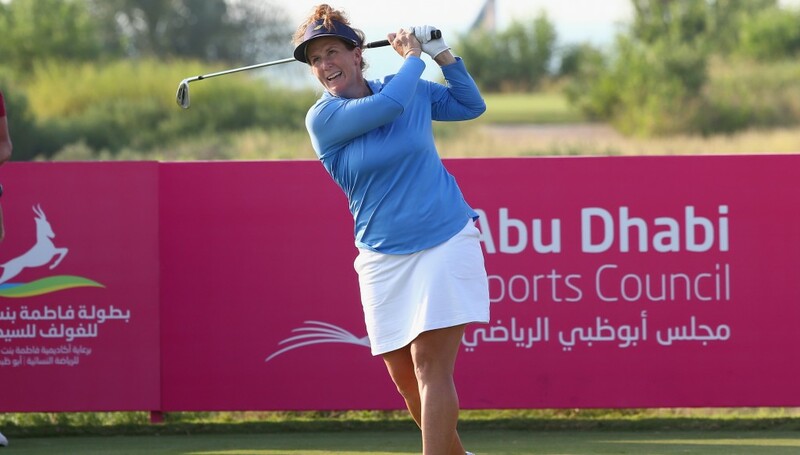 “I am really looking forward to playing in Abu Dhabi on such a beautiful golf course, as well as in an exciting new event format,” said England’s Hull, who is set to make her Abu Dhabi debut at the tournament. “It’s a big year for us with the Solheim Cup taking place in September at Gleneagles, so I want to get a strong start to the new season on the Ladies European Tour and this is the ideal opportunity. Spectators can catch the action for free. For further details, visit www.fbmladiesopen.com or follow Fatima Bint Mubarak Ladies Open on Facebook and @FBMLadiesOpen on Twitter and Instagram. Challenge Tour No1 Joachim B Hansen, Frenchman Victor Perez and Finland’s Kalle Samooja ger ready for the season's final event. The top three players on the European Challenge Tour’s Road to Ras Al Khaimah let their hair down ahead of the season-ending Ras Al Khaimah Challenge Tour grand final when they visited the picturesque Al Wadi Nature Reserve in Ras Al Khaimah. Challenge Tour No1 Joachim B Hansen, Frenchman Victor Perez and Finland’s Kalle Samooja are going head-to-head at Al Hamra Golf Club from Wednesday in a bid to finish the season as Challenge Tour No1 but the three men came together under the scorching UAE sun to hit some balls into the stunning Al Wadi Nature Reserve. The reserve, which spans 1,235 acres within Wadi Khadeja, is famed for its natural beauty and wildlife and welcomes guests from across the world who long to experience the sights and sounds of nature in the northern emirate. As well as the fantastic views, guests can also enjoy a range of activities with falconry shows, camel and horse riding and catch and release fishing all being held in the reserve. “I had a lot of fun today. It was great to see a bit more of Ras Al Khaimah on what is a very special week for me,” said Hansen. Ras Al Khaimah boasts plenty of adventurous activities for thrill seekers to get their adrenaline fix in and around the stunning Jebel Jais, the UAE’s highest mountain range.